The following film, produced by the Eiland Team of Experts, breaks down the events of the Gaza bound flotilla using a timeline that alternates between 3D models and footage captured throughout the incident. 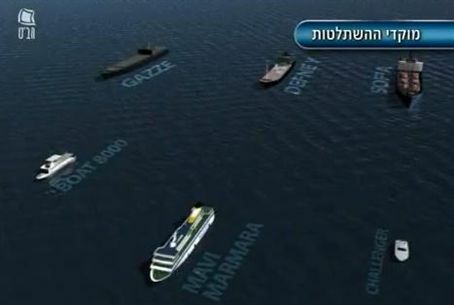 The events leading up to and throughout the flotilla incident are recounted in the video, as presented by the team of experts led by Maj. Gen. (res.) Giora Eiland in the IDF's internal inquiry. The video describes the various ships in the flotilla and the course of their attempted journey to the Gaza Strip from Turkey, as well as the number and extent of Israeli response ships, aircraft, and absorption center for the ships' passengers. The video also outlines the orders given to the IDF soldiers boarding the flotilla ships, including the policy of using gradual force, and using live weapons only in life threatening scenarios.